Pictures and stories from behind the scenes at Sarah’s events and TV segments. Part of my work is looking at the world and sharing examples of what works and doesn’t work. Useful products, new or creative expressions of a trend, clothes that change the proportions of a figure, or innovative fashion…I want to be ready to capture it when it crosses my path. 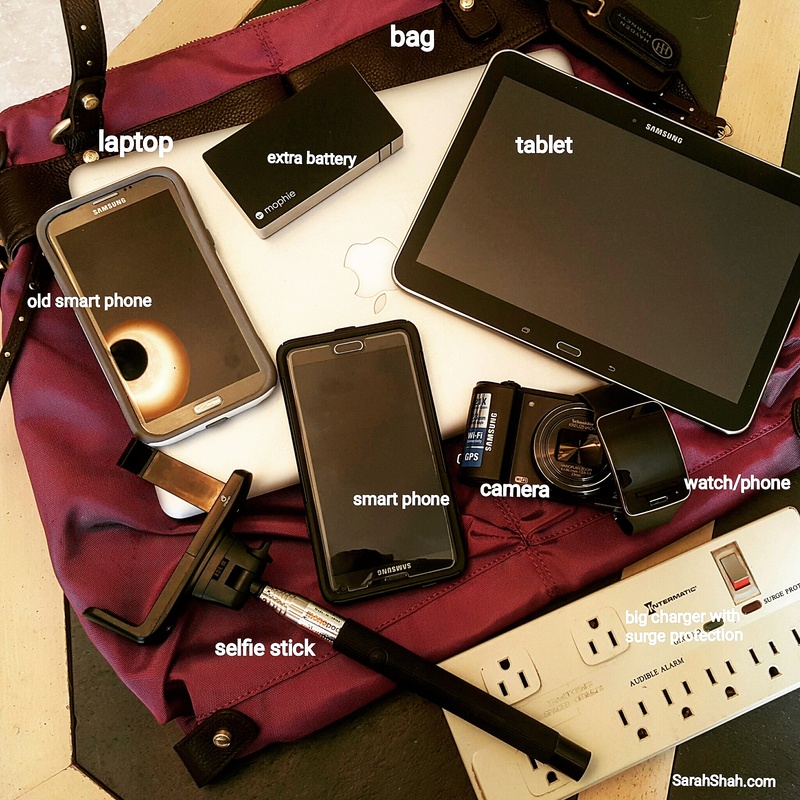 Here are the tools I use, especially when I’m away from home at an event or traveling. Samsung Galaxy Note 4 – smart phone for communication (phone, email, text, social media), taking pics and video, posting to social media, making photo collages, annotating photos, clock and calendar. Samsung Galaxy Note 2 – this phone isn’t connected to a cell network, but it’s still great for taking photos and videos especially in inclement weather, wet environments or anywhere else where my regular phone could get damaged. It also serves as a backup camera, in case the battery in my phone runs out. Samsung Tab 4 – I use this for research, a second screen, as a hotspot when I don’t want to use up my phone pattern. Samsung Gear 2 watch – It’s so convenient to have a phone right on my wrist…I can talk handsfree while I’m using my phone for something else. It’s also a discrete way to see emails and text messages as they come in without pulling out my phone. Samsung camera – This is the back up to ht back up camera. I can also hand this one off to someone without giving away my phone. Mophie external battery – More juice! It has 2 posts so I can recharge 2 devices at the same time. Selfie Stick – I can take way better selfless with this, get photos and videos above crowds and get different perspectives. The camera holder is removable and can be attached to a full-size tripod. So useful! Surge protecting outlet strip – For protecting my devices and charging in a hotel that has only one free outlet. Macbook – For editing videos, uploading, backup communication when the other devices are charging and anything where I need a full screen. Haley Hartnet Ibiza bag – Roomy, durable bag with compartments for everything. And it still looks cute.